In this centenary year of the end of World War 1, writer and producer, Bréon Rydell, was determined that the life and work of Charles Hamilton Sorley, should not be forgotten. Kevin Williamson spoke with him as an important new play about the unjustly neglected Scottish poet prepares to open in Aberdeen and Glasgow. 1. Tell us about how the story of Charles Hamilton Sorley first came onto your radar? I first heard of CHS after being asked to produce the play ‘It Is Easy To Be Dead,’ written by my friend and fellow Scot, Neil McPherson. It tells the story of the poet’s life through his letters and poetry with music and songs from some of the most popular composers of the early twentieth century. It is a powerful and evocative play set against the backdrop of Germany just before the outbreak of World War 1 and recounts the experiences of young Charles Hamilton Sorley, who fell in love with Germany and its culture, a few months before the outbreak of hostilities. I found his life story not only profound and moving, I realised as a Scot myself, that Sorley’s life story was one of the great undiscovered stories of that era and the fact that he was born in Scotland resonated within me at a very deep level. The play covers the period before the outbreak of war, Marlborough College, where Sorley was a pupil, his ‘gap year’ in Germany, enlisting for military training and duty, life, battle and death in the trenches. All these experiences are described in poems and letters he sent to his parents, his teachers and former school-friends. Including some found in his kit-bag after he was killed. 2. 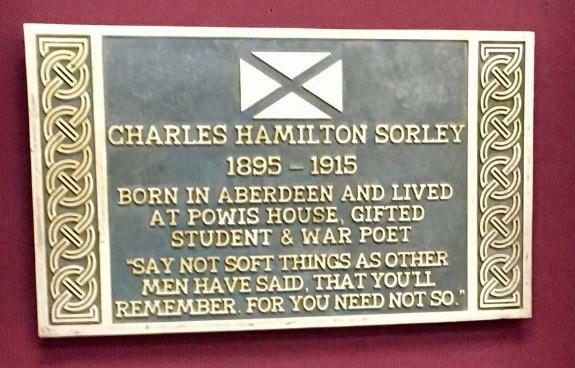 I thought I was aware of most major Scottish poets but I hadn’t read Charles Hamilton Sorley, nor knew of his fascinating life story, short as it was, until you told me about him earlier this year. Why do you think Sorley is still relatively unknown in his own country? As you say, Sorley had a short life. He was one of the first to enlist in 1914. Killed in action a year later at the Battle of Loos, aged 20, Sorley’s poems and letters are among the most profound and moving war literature ever written, and I think one of the contributing factors to him not being well known in his own country is that when WW1 first started, popular opinion was king, country, death, and glory. Sorley certainly didn’t fit into that narrative, quite the opposite. His outspoken views didn’t suit the establishment war-speak of that time. And, unlike the other fêted war poets, who were caught up in rapturous sacrifice, Sorley, shunned sentimentality- here was a teenager telling the world ‘I should so much like to kill whoever is primarily responsible for the war’. Sorley was an outsider, and crucially… he understood the horrors and pity of war long before anyone else. In some quarters, he was viewed as being unpatriotic, but the truth is a little different. Poets like John Masefield (who called Sorley ‘potentially the greatest poet lost to us in that war’) and Robert Graves (who thought him ‘one of the three poets of importance killed in the war’ alongside Wilfred Owen and Isaac Rosenberg) were quick to realise that Sorley’s death in the battle of Loos in 1915 was a major loss. Another factor is creative output. I have no doubt that if he had lived longer, he would have built up a body of work that certainly would have been recognised by his fellow Scots. All of these factors contribute to him remaining relatively unknown in his own country. 3. 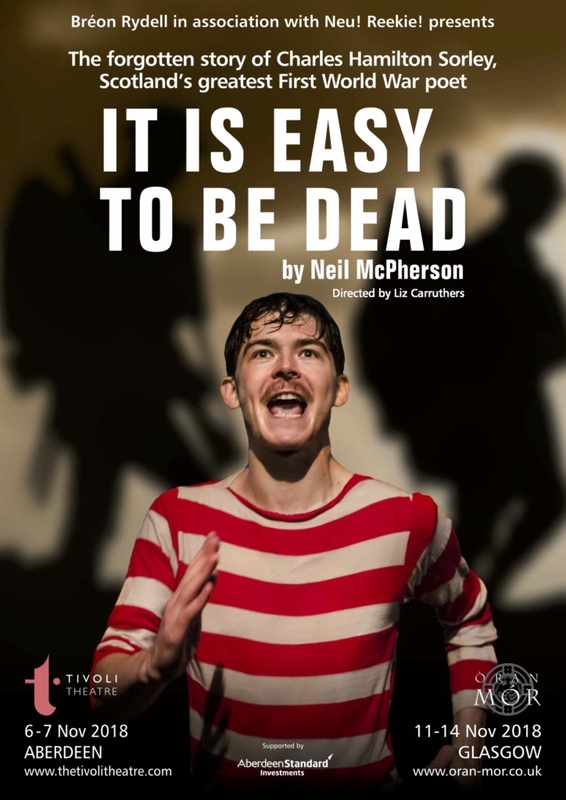 It Is Easy To Be Dead is being performed in Scotland for the first time to coincide with the 100th anniversary of the Armistice: in my opinion the only anniversary connected to WW1 worth celebrating. How does this play, and Sorley’s poetry, connect to a contemporary audience? The audiences who saw the original production said how much Sorley’s life story and poetic vision resonated with them. He was a teenager full of life and hope, living in a world polarised and on the brink of madness – quite similar to the times we are living in today. Sorley was a humanitarian, an internationalist, who spoke truth to power. At nineteen years old he took the equivalent of a gap year and fell in love with Germany and its culture. He was an enlightened, compassionate young man, who was unafraid of the consequences of his words or actions. At the conclusion of the poem, however, he concedes that there will be more bloodshed as he refers to first, WHEN it is peace, and then immediately, qualifies this with the words, but ‘UNTIL PEACE,’ concluding with the combination of threatening elemental forces – each of which can be construed as a symbol of war – the darkness (the trenches), the thunder (the cannons) and the rain (the showers of bullets). As we now commemorate the centenary of the end of WW1, mounting the play ‘It is Easy to be Dead’ in Caledonia, it gives us an opportunity to appreciate the prophetic words of Scottish poet Charles Hamilton Sorley when he painted the clear picture of the devastation of human life that war would cause, and that others would only discover after it was all over. His prescient message is as relevant today as it was then and in an increasingly fragmented world it is a play that inspires rather than divides. I think the time seems right to welcome ‘Charlie’ home to his birth place of Scotland. 4. What can audiences expect from ‘It is easy to be dead’? They can expect a tender, moving, and haunting tribute to a forgotten Scottish poet, who was a remarkable character. I think they will be especially taken by the performance of the lead actor Alex Knox, who is supported by the original cast. It Is Easy To Be Dead opens at The Tivoli, Aberdeen on Tuesday 6 November and will be followed by performances at Òran Mór, Glasgow from Sunday 11 to Wednesday 14 November. Any chance ‘It Is Easy To Be Dead’ might come to Edinburgh? It’s possible that might happen in 2019.